This critter ought to be handy — a tiny circular saw. Clarke is marketing kits for the saw with blades for various applications including wood, metal, plastic, drywall, and ceramic. With precise depth adjustment and what looks like no additional guard, this saw can get into tight spots and still cut a straight line. The pretty, hype-ridden PDF flyer does give some good examples of uses, even though it ignores the really useful fact that it’s small. Street pricing on the kit is $100. Interesting idea…. I’d love to hear some practical reviews of this tool. Canadian Tire up here in Canada(obviously) has the same tool just re-branded it seems. For as good as it seems it might be it is terribly in-effective. The motor is so small that you have to go so slow or it stops cutting. They knew this in the design process so they have a red LED on the top that starts flashing when you are going to fast as a warning. Also the depth setting locking mechanism is plastic and dosen’t really do anything at all. I’d say save the $100 and buy all the cutting tools you need to cut what you would be cutting with this, it’ll be faster and less agravating. As mentioned in Kent’s review, this tool, from the same Chinese factory, has been sold by Canadian Tire stores for over 2 years now. I got one as a gift a year ago. I’m so glad that I didn’t spend any money to get it – and it seems worth every penny I spent. The theory seems great but its execution is soooo bad. Unless you have the hands of a pro basketball player, you’ll have trouble holding and using it with one hand. It’s too fat. Oh ya, you’ll also need 2 thumbs on that hand, one to press the guard release and the other to push the power switch and it’s awkward safety lock. The tool has a sophisticated overload protection circuit to protect the motor with a red light that flashes a warning near the limit. 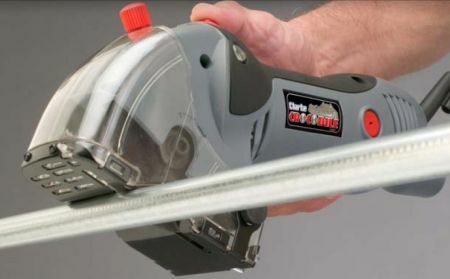 Sadly, it cuts the power as soon as you notice it and way before the tool shows any other signs of distress such as slowing down like all the other power tools in existence. Once it cuts out you have to go through the procedure ( see above) to restart. In a word a dud.